Secretary-General António Guterres (at podium) speaks to the media at an UNRWA school in Beit Lahiya, Gaza. Speaking to reporters at a UN-supported school in northern Gaza, the Secretary-General appealed for unity, in line with the principles of the Palestinian Liberation Organization, which include rejecting violence and terrorism, and recognizing Israel's right to exist in peace. “I have a dream. A dream to one day see the Holy Land with two states – Israel and Palestine – living in peace and security together,” Mr. Guterres told reporters in Beit Lahiya, Gaza, at a school run by the UN Relief and Works Agency for Palestine Refugees in the Near East (UNRWA). 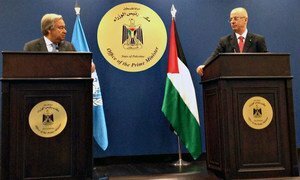 Making this second appeal, Mr. Guterres underscored the importance of a credible political process and actions to improve living conditions of Palestinians. “It is important to open the closures, in line with resolution 1860” he said, referring the Security Council resolution from 2009 which called for an immediate ceasefire to the fighting between Israel and Hamas and lifting of blockades for food, fuel and medicines. The resolution was meant to diffuse an intra-Palestinian conflict which flared when Hamas took over Gaza in 2007. Since then, Israel sought to isolate the group by restricting the movements of goods and people in and out of the strip. In today's statement, Mr. Guterres that it was important to avoid the “build-up of the militantism” that can undermine the confidence between the two people,” he added. The UN chief today appealed to the international community to strongly support humanitarian aid in Gaza. He ordered an immediate release of $4 million from the limited resources of the Central Emergency Relief Fund (CERF), to support the UN activities working for the benefit of the Gaza people. Mr. Guterres, who toured the Israeli-Gaza border by helicopter and then crossed it by vehicle, called the conditions in Gaza, “one of the most dramatic humanitarian crises” he has seen during his time working as a humanitarian. The two million people living in Gaza have lack access to basic services, such as electricity, food or healthcare. The real gross domestic product (GDP) is largely stagnant, unemployment is up and the infrastructure and private sector have been gradually debilitated, according to a UN report published last month. Given the current trends, Gaza would become “unliveable” by 2020, according to the report. Wrapping up his trip to the Middle East, Mr. Guterres today also visited the Museum of the Jewish People, where he reiterated his ongoing calls for an end to anti-Semitism around the world. Pledging that he will do all possible to stand against anti-Semitism and all other forms of bigotry and discrimination, Mr. Guteres stressed that anti-Semitism includes calls for the destruction of Israel. “Israel is a Member State of the United Nations. It bears all the responsibilities and enjoys all the rights of every other Member State and, therefore, it must be treated as such,” he stressed. Mr. Guterres described meeting families in Nahal Oz, a kibbutz close to the Gaza Strip. Speaking with relatives of a child killed by a Palestinian rocket, he told of a request to help the Palestinians in Gaza have better lives. “Let us not forget that those individual peacebuilders represent the best faces of their communities and serve as the human foundation so essential for a lasting peace, here and everywhere,” he said. United Nations Secretary-General António Guterres today reiterated his call for a political solution to the Middle East conflict that would end Israel's occupation of Palestinian land and would create an independent Palestinian state, living side by side with Israel in peace and security.